After careful debate we’ve decided to stick with the more classic route. It features a few gastro pubs, a trendy bar and a McSpoons but we like it. 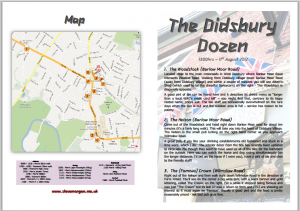 Here is an updated guide: The Didsbury Dozen August 2012 – if you print it off it folds into a nice four page booklet. We’re starting at 1300hrs in the Woodstock – see you there!